Model: Asus produces a full line of notebooks and desktops of all shapes and sizes for business markets under the AsusPro flag. AsusPro is the business arm for Asus, a company better known for its gaming motherboards, video cards, and notebooks under the Republic of Gamers sub-brand. According to ASUS, the Asus B9440UA is the world’s lightest 14-inch business notebook and is on par with many 13-inch notebooks. 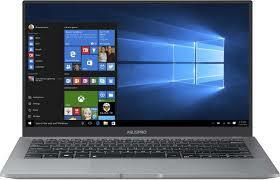 The 14-inch Full HD display has thin bezels, allowing the display to fit into a smaller frame. The chassis of the 1.05 kg (2.31 lb) notebook is made of magnesium alloy, which is far more rigid than aluminum alloy. The notebook can also take a beating and has passed MIL-STD 810G standards for durability. It passed extra-high drop, 50,000-cycle hinge, lid pressure, and keyboard spill resistance tests. The ten-hour battery life will also last through most normal business days. The laptop has an island-style keyboard with full-size keys. The 1.5 mm key travel, coupled with the light action of the keys, makes for a comfortable typing experience. There are three different backlighting brightness levels, toggled by pressing the Fn and the F3 or F4 keys. The illumination can, of course, be turned off entirely. The backlighting is visible during the daytime. Just one type of display is offered on the AsusPro B9440. Its 1080p (1,920x1,080) resolution is the sweet spot for usability and performance. The display has wide viewing angles, thanks to the IPS technology, and excellent overall image quality. Asus advertises that the display covers 72 percent of the NTSC color gamut, which is well above average. The anti-glare surface on this display is practical for keeping reflections to a minimum. This is especially important in an office environment with overhead lighting. 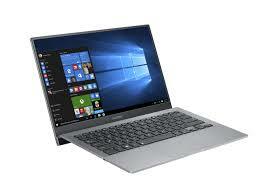 The AsusPro B9440 has specs befitting an ultrabook. It supports Intel Kaby Lake dual-core processors, with up to a 15-watt thermal design power (TDP) rating. 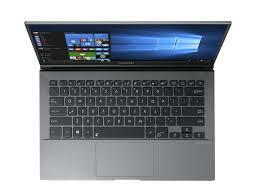 It has a Core i5-7200U dual-core CPU, running at 2.5 GHz, with a Turbo Boost feature up to 3.1 GHz. This CPU has ample performance for most tasks. RAM is of the soldered/non-upgradable. This B9440UA configuration includes a 512 GB SSD as its only internal storage. It used an SATA interface, but Asus lists PCI Express drives as being compatible with this notebook. Either way, it felt fast enough for daily usage. Another highlight of the laptop is the sound of the speakers, which is impressively immersive with rich bass and crystal-clear sound. Delivered by the powerful ASUS SonicMaster audio system, which is designed with Harman/Kardon, it ensures every decibel is music to ears. The audio system of the B9440 was tuned by experts from the ASUS ‘Golden Ears' audio team as well as renowned audiophile company, Harman/Kardon, to ensure the best experience for the playback of a wide variety of content. The Asus B9440UA is a perfect all-rounder with reasonable specs and an affordable price tag.